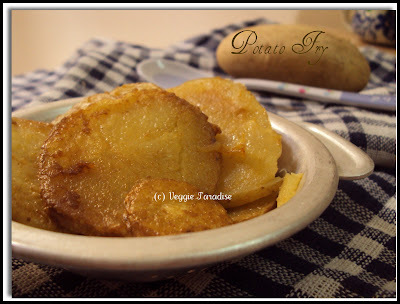 A delicious side dish with potatoes . A must to try with curd rice/Sambar rice. Wash and chop the potatoes. Heat oil in a pan. Add the crushed garlic and saute for a min. Now add the chopped potatoes along with sambar powder and salt. Mix them well. Add little water ,cover with a lid and cook them in low flame until the potatoes get softened. (Stir them occasionally to avoid the potatoes from breaking ). If I had not read the potato, I would have assumed it to be something else very luscious... because that is the look.... Very tempting like it was some kinda pudding or baked stuff..... I love the look..... KUDOS!!!! simply superb ,today i include this recipe in my lunch. really nice n crispy looking...wow! This is a different potato fry I have seen..
Aruna,,how are you there dear...looks soo simple n quick fry dear,,who says nooo to potato sure will try this soon..
Can have this any time of the day. Lovely dish,simple yet tasty. Looks really good and super easy!! oh, very easy and yummy looking fry. U have made cooking so easy. love it. That sounds easy and delicious too! nice simple recipe and minimum ingredients.. I like simple dishes. Lovely dish & looks delicious. simple and looks so delicious.ya best with sambar rice.. sometimes i prepare this for chappathi too. Potato fry looks really good. 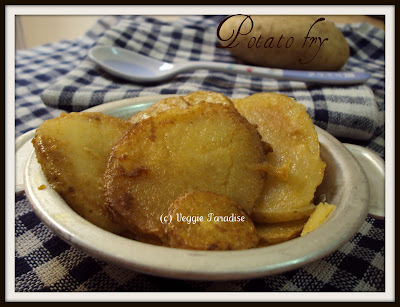 Simple and delicious fry..I would love to have it with curd rice..Nice pics!! I thought potatoes need to be chopped fine for good curry but yours look fabulous.Garlic gives a lovely flavor to the dish!